Can you tell me anything about the bus above? I know the number plate dates between 1904 and 1929, but I would like to narrow the date down if possible. I understand that these buses had a petrol engine which was used to drive a dynamo which, in turn, fed an electric motor driving the wheels. It was claimed that they were cheaper to use and easier for tram drivers to learn to operate. Their maximum permitted speed was 12 mph. Is this information correct as far as you know? Avril - according to the excellent Leeds Transport Volume 2 by J Soper, this bus was a Tilling Stevens chassis with a Leeds City Tramways body, seating 24, transferred from an older bus dating from 1907. It was registered in 1913 and withdrawn from service in 1919. However, it served as an ambulance between 1915 and 1917. After withdrawal, its body was transferred to yet another bus and the chassis was scrapped in 1926. Quite an eventful life for such a short period of service. This was one of the first tramway feeder services introduced by Leeds, running from the Moortown tramway to the village of Shadwell. "This bus is a model TTA1, produced from 1911 and superseded in 1913 by the TTA2, which had a radiator more in keeping with successive Tilling-Stevens. Both models were petrol-electrics, metamorphosing into the TS7 model and continuing in production into the late 1920’s, at least. I’m not aware of T-S producing any conventional clutch/gearbox models until the B9 in 1927. These were quickly followed by the B10/10A, then the TSM B60 in 1931. TSM reverted to its original T-S name in 1937. As for speed limits, commercial vehicles with solid tyres were restricted to 12mph until 1928, when limits for pneumatic-tyred vehicles were increased to 20mph. To encourage fast conversion to the safer pneumatic tyres, solid-tyred vehicles thus converted could also do 20mph." Many thanks indeed Chris H for the finer points of the Tilling-Stevens specifications, about such early history of which I knew very little. It would appear from pre WW1 editions of Commercial Motor that a transmission design using the petrol electric principle was patented jointly by Messrs Percy Frost-Smith (Chief Engineer of Thomas Tilling Limited), Frank Brown (Chairman of David Brown of Huddersfield), and W. A. Stevens of Maidstone, the latter being credited as the inventor and manufacturer of the electrical system. The roles of Percy Frost-Smith and W. A. Stevens are self evident, but just what was exactly the involvement of the David Brown company is unclear. The first Stevens petrol electric vehicle appeared in 1906, but, in the early days, this transmission method was not exclusive to Tilling machinery. At the 1907 Commercial Motor Show, in addition to the W. A. Stevens exhibits, petrol electric vehicles using simpler variations upon the principle were displayed by Greenwood and Batley of Leeds and Straker Squire of Edmonton, London. Also from 1907, petrol electrics employing the more sophisticated Stevens transmission were offered by the J. & E. Hall company of Dartford as 'Hallford Stevens'. These used an engine built under Saurer patents and a worm driven rear axle of somewhat dubious reliability of 'S B & S' manufacture (though it is unclear what these letters stood for). Rather later, from 1916, Dennis of Guildford briefly followed suit with the 'Dennis Stevens'. However, it was the Tilling company that wholeheartedly adopted the petrol electric system by buying the W. A. Stevens concern in 1907 and becoming the strongest advocate of this type of transmission. It is noteworthy that the earliest Tilling Stevens vehicles employed the Dennis worm driven rear axle which was the most advanced and reliable form of final drive available at the time. As Chris H states, although it is thought that conventional gearboxes were fitted to some Tilling Stevens goods models during WW1, this did not happen with the buses until the 1920s, by which time the extra weight and performance limitations of the petrol electric system were becoming increasingly apparent in an age when gearbox technology and driver skills had advanced greatly. Chris H. has awakened an old interest of mine! The petrol electric TS TTA series changed to TS3 in 1914, and the TS6 forward control variant appeared c.1923. Thomas Tilling reequipped his own fleet with the TS7 model, also forward control, so how did that differ from the TS6? Also, there were smaller nc. variants, TS4 and , presumably TS5, Blackpool`s first motorbuses being an example, and the last petrol electric variant I can find is the 1928 3 axle double decker, with magnificent Dodson body, supplied to Wolverhampton. Subsequent models were of the "Express" B9 series. Some of the first customers for the TTA/TS3 were fleets who had suffered commandeering of chassis at the outset of WW1, an example being Bournemouth, whose 2 1914 Brush bodies had their Daimler chassis replaced by TS3. Ironic that the change to "conventional mechanics" did not herald a bright future for the concern. With the National and Bristol concerns coming largely under Tilling control, Bristol was the way forward! On a final note, one of the London "pirates" operated Frost/Stevens petrol electrics, and just how different they were is another unanswered question of mine! Nice to see you cogitating over 1920's buses again, John! T-S dabbled in all sorts of things, even a petrol-electric trolleybus, which I've seen a photo of in the past. They produced petrol-electric fire engines, which utilised the onboard electric generating ability for hose pumps etc and tipup lorries with electric tipup system. As for the London pirate, it should be remembered that Percival Frost-Smith designed and patented the petrol-electric principles which W A Stevens used with bus-building. It may be that Hall or Dennis were not the only builders and Frost-Smith was also involved at some stage. Or maybe it's a misunderstanding of the author who wrote about it. The severing of the connexion by Thos. Tilling from T-S clearly lost them guaranteed business, but changing their name to TSM wouldn't have helped, either, I suspect. I also suspect that buying Vulcan was an attempt to change direction to some extent, but decline was relentless. The war bought them time, as did the big 1947/48 order from Hong Kong, but most sales after around 1933 were in penny numbers, unfortunately. In many ways, I'm surprised they lasted as long as they did in that post-Wall Street depression. Plenty of others didn't, in a decade which also saw the dramatic rise of AEC/Leyland. Hi Chris H, and yes, I am still cogitating over 1920s buses, amongst others! The trolleybus/motorbus was a normal control Roe bodied vehicle in the Tees Side fleet, but Wolverhampton had a sizeable fleet of "TS6" type Dodson single deck "orthodox" trolleybuses before switching to Guy as well. Although his name features prominently in patents for the system, it is doubtful that Percy Frost-Smith can be credited with being the "inventor" of the petrol electric transmission for motor vehicles. The principle of driving a dynamo by coupling it to a petrol engine was tried for a number of applications at the turn of the 20th century. Several inventors conceived differing methods of harnessing and controlling the power so generated for motorised transport purposes. The German born, Belgian based engineer and gunsmith, Henri Pieper (1840-1898) invented a petrol electric propulsion system for vehicles before the turn of the 20th century. The Daimler KPL double decker (the letters stood for Knight, Pieper and Lanchester) of 1910 was of integral construction, and all the units were attached externally along the outside of the vehicle. Frost-Smith declared that the propulsion system infringed "his" patents, and threatened to sue in the courts. It is doubtful if he would have succeeded as the Pieper principle of the KPL predated the Stevens system and was covered by patents of its own, but its complexity was probably a limiting factor, and it disappeared from the scene. Earlier, the solitary Hart-Durtnall petrol electric prototype ran in London from 1905. Greenwood and Batley and also Straker Squire revealed petrol electric vehicles in 1907. However, the real brain behind the practical petrol electric was that of W. A. Stevens. William Arthur Stevens (1864-1935) spent ten years as a physics teacher at Maidstone's technical schools before becoming a consultant electrical engineer, firstly to the Imperial Paper Mills at Gravesend and then to Maidstone Corporation. He inherited his father's timber business in Maidstone, and, in 1897, set himself up in those premises as an electrical engineer. By 1906 he had developed a practical form of petrol electric transmission with sophisticated control that was fitted to a private car. Percy Frost-Smith (c1876 -1924) was a mechanical engineer who was involved in the public transport industry in Britain and in Spain, but then left to work for Petters in Yeovil, Somerset. In February 1905 he was appointed chief engineer to Thomas Tilling Limited. He became deeply interested in the petrol electric transmission system, possibly seeing it as a simple way of converting horse bus drivers to mechanical transport, and convinced the Tilling board that it should invest in developing the project. Mr Frost-Smith was clearly a canny chap of firmly held and probably outspoken views, who ensured that he featured personally in the patent applications. As the engineer to Thomas Tilling, his promotional powers were of major significance. No doubt he had much to do with the development of a practical and reliable bus, and his background in passenger vehicle engineering would have been invaluable, but he was not the inventor of the Stevens form of transmission. The credit for that must be shared primarily with Stevens, and also with the David Brown company which designed the final drive. The initial developments and first commercial applications were in Hallford chassis made by J.E. Hall in Dartford, a mere 20 miles or so up the road from Maidstone. At first the buses were known as 'S B & S' for "Smith, Brown and Stevens". The lorries were branded as "Hallford Stevens" reflecting the true inventor of the traction system. Thomas Tilling bought the Stevens business at a date variously given as 1906 or 1911, renamed it Tilling Stevens, and, from 1911, embarked upon manufacture of the TTA1, though some sources suggest that Tilling built its first petrol electrics at its Bull Yard premises in Peckham. The 30hp TTA1 was soon followed by the more powerful TTA2 of 40 hp. It is often stated that the petrol electric system was not favoured by the military authorities, and vehicles so propelled were exempt from requisitioning by the War Department in the Great War. However, around 300 Tilling Stevens petrol electric lorries were produced for the WD during that war, so it would seem that this is another piece of transport history folklore that might bear more detailed examination. As the earlier advantages of the petrol electric system became progressively eroded by post WW1 engineering advances and improved driver familiarity with all forms of motor transport, the Tilling group's enthusiasm for the type began to wane. This could have been a factor in W.A. Stevens leaving the business in 1917. In 1919 Tilling Stevens was floated as a separate public company, which then set upon an expansionist programme, including the construction of a fine new factory in Maidstone in the 'Daylight' architectural style. This splendid 1920 building happily survives today. This loosening of the ties with the Tilling empire might explain the departure from the group of Mr Frost-Smith himself in 1920, when he set up his own manufacturing business to produce a petrol electric bus for the independent or "pirate" market in London. Well proven components were utilised, such as White & Poppe engines, Kirkstall rear axles and many units of Dennis manufacture. It is thought that the FS Petrol Electric Equipment Company built and ran six examples of its double deck omnibus, but, surprisingly, reliability fell well short of the established Tilling Stevens standard, and no others were made. By the end of 1924, the renamed FS Petrol Electric Omnibus Company was bankrupt, and a dispirited Frost-Smith fell ill suddenly and died on the 24th December at the early age of 48. 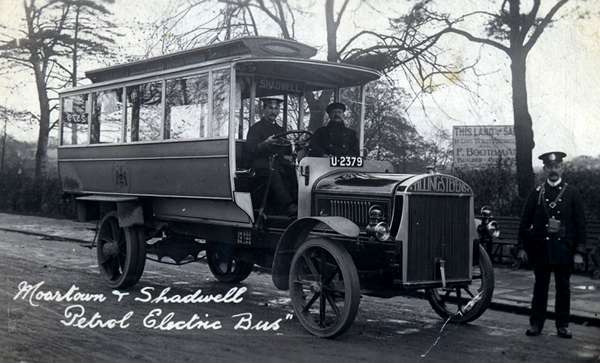 Although it began turning increasingly to the manufacture of vehicles with conventional transmissions - the B9 and, particularly, B10 models sold very well, over 2000 by 1929 - Tilling Stevens continued to make petrol electric buses up to the TS17A, but this failed to impress the Thomas Tilling operating companies. Having entered into a joint agreement in 1924 with BET in the shareholding of the British Automobile Traction Company, Tilling began concentrating its attention on provincial bus companies, several of which were operating fleets of Bristol manufacture. Up till then, the chairman and guiding light of Thomas Tilling had been the genial Richard Tilling, but he died suddenly in June 1929, and the position went to the rather prickly character, J. F. Heaton. All the remaining Tilling family members resigned from the board in protest. One sees the heavy hand of Heaton in the sudden disposal by Tilling in 1930 of all its shareholding in the Maidstone company, a decision very probably not unconnected with the purchase the following year of the Bristol manufacturing business - no doubt discussions had begun much earlier. Though the Stevens petrol electric system fell out of favour for road vehicles, it was revived during WW2 for searchlight generators, which the Tilling Stevens firm supplied in large numbers. (The modern interest in hybrid cars is a further reawakening of the same principle.) One final point; I always understood that the TTA1 had the radiator behind the engine in the style of early Renaults, as seen here:- www.bmiht.co.uk/catalogue/one and www.bmiht.co.uk/catalogue/two I believe that the picture above of the Moortown to Shadwell bus shows an early TTA2. I really would like to thank you for that very detailed account of the development of the petrol electric, including the Frost Stevens story, and his "pirate" connection. There was a great deal in that account which I did not know, and it was extremely interesting. The only question I have is in connection with the designation; when did the TS series begin to be used after the TTA, and just how many TS variants were there? What a great facility this site is, when such detail can be shared! In my case, the old adage applies: "The older I get, the more I realise how little I know"
By the way, the Wolverhampton 6 wheeler I mentioned earlier was a TS15A. As an enthusiast of Bradford`s transport history, I was delighted to discover that we had a (TS3?) tower wagon which survived into the post war period.